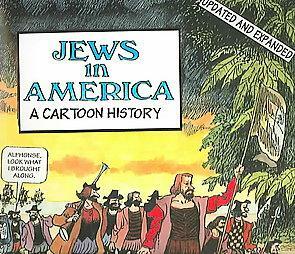 I was at the Pape/Danforth Library , browsing the graphic novel section for any works by Chester Brown1, I didn’t find any, but I did find this book, Jews In America. As a Jew in (North) America, I figured much of my people’s history will be in here. Sure I knew not to expect stories of riots in Christie Pits, or the tales of Montreal Jews, but I knew there would be some connections. Well, the author, David Gantz, unfortunately doesn’t really tell much of a story. His book is so disjointed that he doesn’t get across any interesting stories, he just briefly glosses over the horrors and success that Jews found in America. It was interesting to find out that some of the crew aboard Columbus’ first voyage to the American continents were Jewish, but his explanation of their need to leave Spain was simply, “It was the inquisition, they had to leave.” While any adult Jew knows of the horrors of Inquisition, I’m sure that many grade eight students don’t quite know the extent of the drama those Sephardic Jews faced. History in comic form is an excellent educational tool for middle school aged students who are learning about their history. This isn’t a good example of that. The art isn’t even anything to show interest, either. I’m unsure if he’s drawing caricatures or attempting realism, Gantz has got no solid style throughout the book that really comes across to the reader to connect the stories. I’m also slightly annoyed with his coverage of the Suez Crisis, with nary a mention of Lester B. Pearson, a man who I think to be one of history’s greatest, who won a Nobel Peace Prize for saving the world.